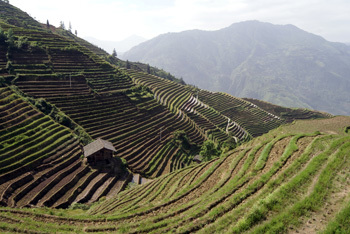 Our next stop: the Longsheng rice terraces, where we stay for two nights in a village called Ping'an. 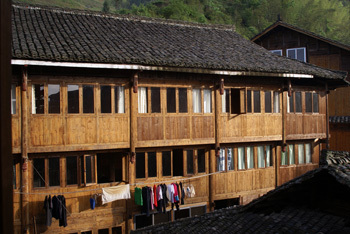 In many guidebooks and travel brochures, Ping'an is described as "a small village where you can rent basic accommodation in a small guesthouse run by a local family of the Zhang minority". Don't be fooled, this is still China. Things that are interesting for tourists are NEVER small-scale. The large parking area full of touring cars will help you remind that. So it doesn't come as a surprise to me that our small local-family-run guesthouse isn't the only small guesthouse in Ping'an. 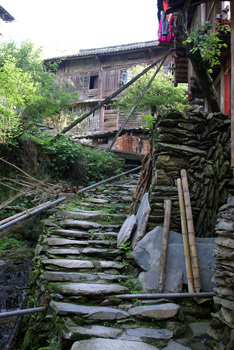 But still, after the noise and the traffic jams of Kunming, Ping'an is a very nice place. I think the most important reason that makes Ping'an a nice place, is the parking for the touring cars. 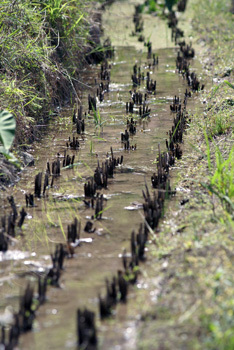 This is where the road ends, from there you have to walk 15 minutes to reach the village itself. For a few renminbi, your luggage will be carried by one of those fragile Zhang women. When we arrive in Ping'an, it's almost dark. 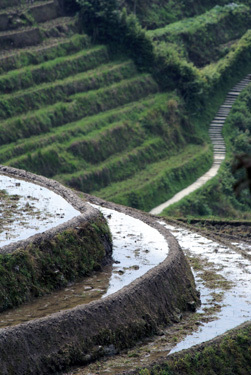 We don't think it's a good idea to explore the rice terraces in the dark, so we install ourselves in the guesthouse, where we have a very decent meal and empty the guesthouse's supply of whisky. Ok, so it's small-scale after all . The next morning, I get up very early. I guess it will be a while before the rest of my group will be awake, so I go out on my own. 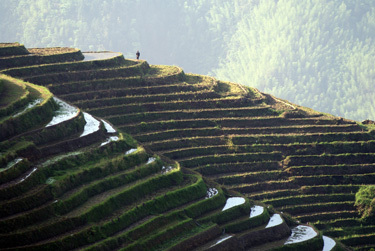 Let's see those famous rice terraces! Being this early is a smart thing. It isn't very hot yet, and the terrace landscape is truly fascinating. 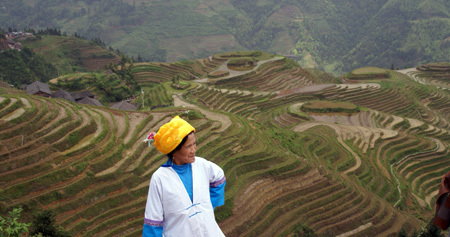 Those hills are very steep, and it's amazing to see what the local people did to make agriculture possible. After some time, I go back to the guesthouse for breakfast. Ah, the rest of the group is awake by now. Together, we go into the hills again. A little bit slower this time, temperature isn't nice and cool anymore. At one of the frequent stops to cool down a bit, we have a laugh at the creative names the Chinese have given to the terraces. 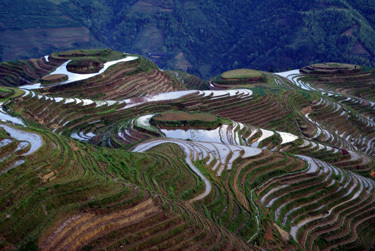 The area around Ping'an is called Dragon's Backbone Terraces (Longji Titian). Ok, that's an accurate name. The names of the two main viewpoints are not that obvious: one is named Nine Dragons and Five Tigers, and the other one Seven Stars with Moon. Right, those Chinese have lots of imagination. More than we have.